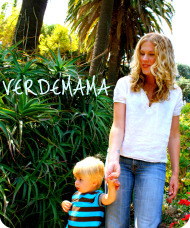 While pregnant with Orion, I spent a lot of time imagining what life with my child would be like. The fantasy played out something like this: he would nap frequently and at great length; he would eat only organic, homemade food; we would go to museums, gardens and cultural events together; he would never watch TV (and I would never, ever use the TV as a babysitter while I stole a few precious moments for myself to pee or brush my teeth); and he would play with only earth-friendly educational toys. Fast forward one year, and I’m having a good laugh at my former idealistic self. We’re doing pretty well with the organic food and getting out to museums and such, but I’m starting to recognize reruns of Sesame Street and my living room is piled high with cheap plastic toys. As it turns out, my son happens to LOVE cheap plastic toys but it makes me a little sick to think how so many toys are manufactured and summarily chucked into the landfill each year. No bueno. 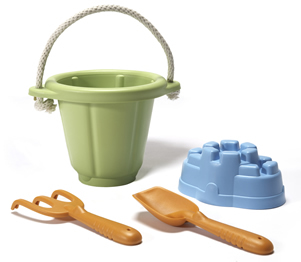 That’s one reason I’m loving Green Toys’ Sand Play Set, a sturdy sand pail, shovel, rake and sand castle mold made from recycled milk jugs. They’re high quality, made in the good ol’ US of A toys that can really take a beating and still come back for more. 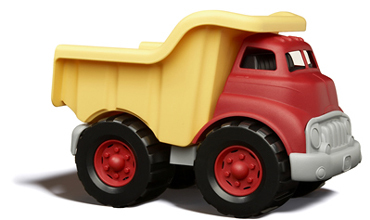 He also received this Green Toys Dump Truck for his birthday. Equally sturdy and awesome. Plus they have some other toys that look really cool, as well as BPA-free eating utensils. We road tested the sand toys—or park tested, rather—and they were a major hit. 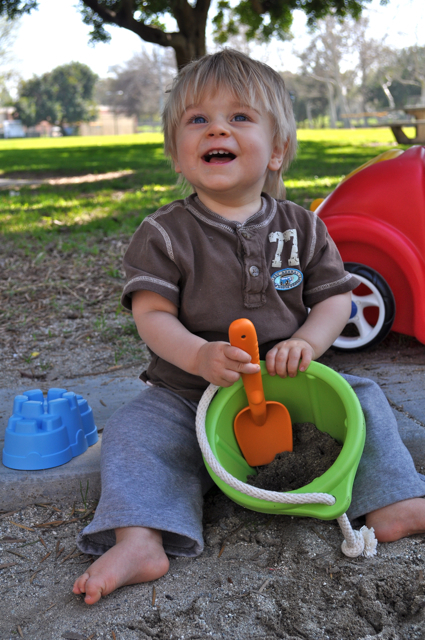 Orion is quite the sand box aficionado so for him to put his stamp of approval on these toys is really saying something.